Whoever says barbeque is only fo r meat lovers has clearly never been to Sugarfire Smoke House! This restaurant has taken barbeque to another level with gourmet sides, vegetarian dishes, fish options, and desserts. 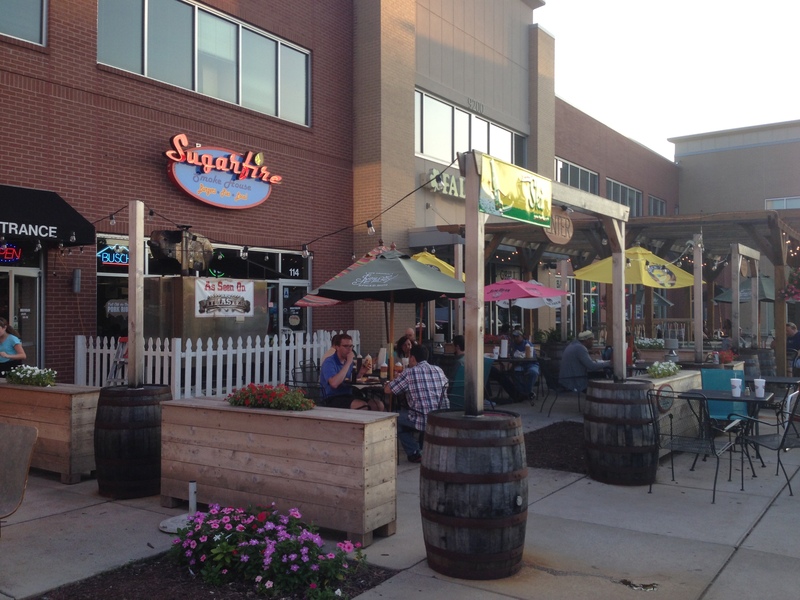 Sugarfire opened its first location in Olivette but has become so popular that it quickly expanded to St. Charles and Wing Haven. The lights on the front patio caught my eye one evening when I was driving by so I decided to check it out for dinner. The restaurant is set up cafeteria style with a fast moving line that wraps around the outside of the dining area. Large, ever changing menus are set up on two walls and can be a little overwhelming if you don’t know what you are looking for. While waiting to place my order, I first came to the soda machine featuring several Excel Bottling brands that I had never seen before and it took a few samples to find what I actually wanted. After settling on lemon-lime, I scanned over the menu featuring turkey, brisket, pulled pork, ribs, sausage, burgers, salmon, and portabella mushrooms. Most items can be ordered as a plate or sandwich and some have side dishes included. If you are hoping to eat your meal off of a plate you will have to keep wishing because meals are served on a large metal tray covered in butcher paper which I think just adds to the experience. Once you are seated, you can top off your meal with one of the many sauces that are waiting for you on the table. There is everything from sweet BBQ to white horseradish to coffee sauce. Being a non-meat eater, I chose the salmon sandwich as my entree. The salmon had a great smoky flavor and was really tender but I found the portion to be a little small. What really made the sandwich great was the bun which was lightly buttered, grilled, and served warm. My husband ordered the Big Muddy which is a sandwich made of brisket, sausage, horseradish sauce, BBQ sauce, lettuce, and pickles. This huge sandwich is definitely not first date food but is well worth the mess. While we both loved our main dishes, the sides were a huge disappointment. I ordered the quinoa caprese salad made with quinoa, kale, tomatoes, and mozzarella. It was swimming in dressing that filled half of dish leaving me with soggy kale and tomatoes that I ended up throwing away. My husband ordered the jambalaya and he was originally told they had run out. However, someone found one last portion sitting on the counter already in a plastic container. When he opened the lid, the top was dry, crusty, and unappetizing. Having ditched my side, I was still hungry so I went back for mac and cheese. It was fresh, creamy, and while less interesting, a much better choice. My only other complaint about my experience was the attitude of the workers. While the restaurant was busy, some of the workers acted rushed and inconvenienced. A little smile can go a long way! Next up for this fast growing BBQ empire is dessert. Sugar Fire Pie is slated to open in October just a few doors down from their current BBQ location in Olivette and you can bet I will be in line for that one. Keep up with all of my posts by clicking Follow at the top of this page for e-mail updates or find me on Twitter at @myweeklybite!